The tab "BFBС2 Player name " has disappeared in the upper left drop-down list. Will the tab be restored again? 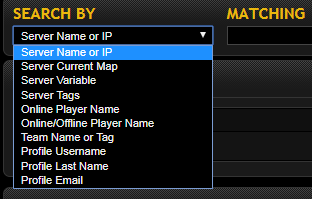 BC2 player search feature, player banners, and player stats pages have now been discontinued at this time. I am a community user. Note: I neither read nor reply to PMs asking for support. Please use the forums for questions. Hello, BC2 player search feature, player banners, and player stats pages have now been discontinued at this time. When will it be restored? I am interested in this question too. We really need these features in managing our servers. The administration of the forum gametracker.com can tell us how the administrator of the game server will be able to independently collect the statistics of the players of a certain server, if, for example, he has his own forum. Is it possible to do this on the forum on the basis of phpbb? If this is possible, then who can help us to realize this? The administration of the forum gametracker.com can tell us how the administrator of the game server will be able to independently collect the statistics of the players of a certain server, if, for example, he has his own forum. Is it possible to do this on the forum on the basis of phpbb? If this is possible, then who can help us to realize this? I support this issue. I'm a server administrator with a good rating - AntiBlood. gametracker, if possible - restore the statistics. What should the owners of servers do to restore the statistics collection? Perhaps the game is obsolete, but now it is played by real fans. In this section, apart from me, 4 more administrators of game servers wrote about the problems. Anti-cleaning systems for BFBС2 are hopelessly outdated - viewing the statistics in your forum was the last way, although how to identify cheaters. Please help us and answer the questions. This was a special setup utilizing other services. These servers are now rendered obsolete and no longer responsive. This was a special setup utilizing other services. These servers are now rendered obsolete and no longer responsive. Topic is now closed.